Oral cancer is a range of cancerous abnormalities inside the mouth and throat. They are arbitrarily divided into two major categories that are based solely on location. Oral cavity cancers are technically in the front of the mouth and that portion of the tongue. Oropharyngeal cancers may be at the base of the tongue, throat, tonsils, and overall deeper in the oral location. Oropharyngeal cancers in the deeper ingresses of the mouth are more frequently being linked to the human papillomavirus (HPV) virus. The telomeres in cancerous cells are often the problem. The DNA of the cell is not copied correctly when the cells split because the cells are dividing rapidly without reaching the point of finality. The telomeres are there to protect the DNA when the blueprint is copied during a cell division. The telomeres are a type of junk data that is simply added onto the ends of the DNA. It grows shorter and shorter as the DNA divides as a natural limit on cell divisions to prevent cancer. Cancers typically occur because this process of cell-splitting mitosis becomes more difficult as we age and our bodies become less efficient at producing the proper balance of enzymes like telomerase that we need for healthy cell division. Aside from acquiring cancer from HPV, men are the ones most at risk. Men who are fifty-five years or older that drink heavily and use tobacco are the highest risk group. Twice as many men will develop oral cancers than women. Poor diet and lifestyle factors can contribute to the increased risks of oral cancer. Poor hygiene may also contribute to increased risk of cancers. It is unclear whether the vaccine for the sexually transmitted human papillomavirus also prevents the cancers associated with infection. In some cases, patients who wear dental appliances such as dentures or partials may trap food particles or irritate the lining of the mouth. This constant irritation may increase the risk of oral cancers. Alcohol-based mouthwashes may also increase the risks for cancer. However, the studies are inconclusive if we consider that alcoholics and tobacco users are also more likely to use alcohol-based mouthwashes. The dentists at Midway Family and Cosmetic Dentistry are in the best position to detect oral cancers during a routine examination or when you report symptoms. You may be able to see them yourself as white or red spots that never seem to heal. Some of the symptoms may be similar to those of an infection. If the lesion is due to an infection, an antibiotic can cause the lesion to heal. 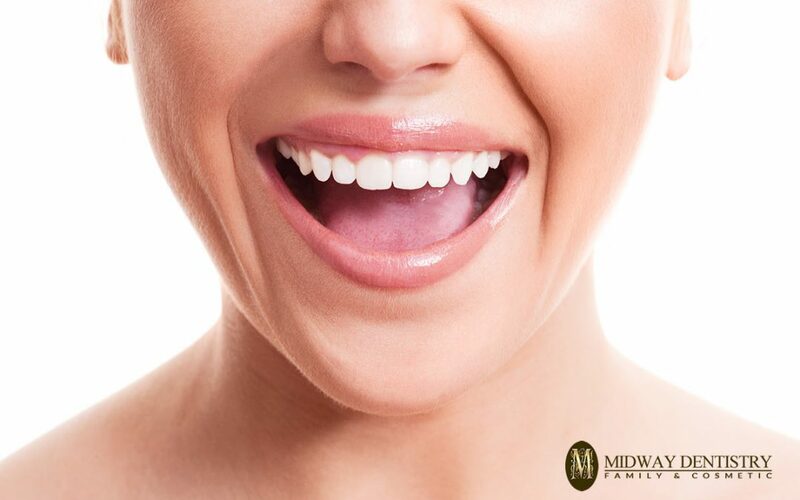 The only way to be sure is to have it examined by your dentist at Midway Family & Cosmetic Dentistry. The types of cancers that may occur and their specific qualities may be too difficult for the layman to digest. This is why you should schedule an appointment with Midway Family and Cosmetic Dentistry if you believe you are at risk. There may warning signs before an actual oral cancer develops. Any cell in the body has the potential to multiply into cancerous cells if there is some disruption during mitosis or damage to the DNA. Only your local dentist or other dental specialist has the years of training to determine the best course in prevention and treatment. By living a healthy lifestyle, having exceptional home care, visiting your dentist at least twice a year, and avoiding known carcinogens, you will greatly reduce the risks of developing oral cancer. At Midway Family and Cosmetic Dentistry, we give our patients an oral cancer screening during routine examination. If you are experiencing any of the signs or symptoms, it is imperative to find it early. Give us a call or email us to book an appointment in our office.